Cover of the first CAPAZ Working Paper. Salas Salazar, L.G., Camelo, F.E., Wolff, J. (noviembre de 2018). Dinámicas territoriales de la violencia y del conflicto armado antes y después del acuerdo de paz con las FARC-EP. Estudio de caso: municipio de Tumaco, Nariño. Documento de trabajo 1-2018. Bogotá, Colombia: Instituto CAPAZ. 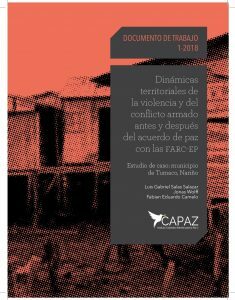 The German-Colombian Peace Institute, CAPAZ publishes its first working paper “Territorial dynamics of the violence and armed conflict before and after the peace accord with the FARC-EP. Case study: Tumaco, Nariño”. This paper has been written by researchers Luis Gabriel Salas Salazar and Fabián Eduardo Camelo (Universidad Nacional de Colombia), and Jonas Wolff (Peace Research Institute Frankfurt-PRIF). 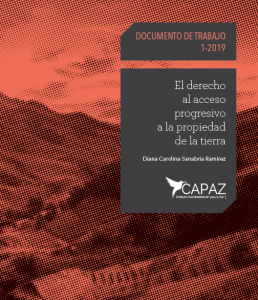 Download the first CAPAZ Working Paper 1-2018 (in Spanish).